Publicidad Vinculando // 18 Sep, 2017 // ~ 3 minutos de lectura. Ethical fashion is more popular than ever before. This rapid rise in popularity has forced major brands to become more transparent and has even begun to uproot the way clothing is manufactured. There has never been a more conscientious generation of consumers, with millions now seeking out clothing that is fair trade and sustainable. What’s causing the skyrocketing popularity of eco fashion? Concern for the planet has begun to touch every aspect of people’s lives. That concern has only grown as increasingly disturbing environmental reports are released every year. Popular awareness now includes what kind of companies consumers want to support when they purchase new clothes. Now, more than ever, people are connecting their purchases and their politics and putting their money where their mouth is. What exactly is eco fashion? It’s pretty broad, but at its core it focuses on ethical and compassionate production and sourcing of raw materials. Brands try to use sustainable resources, purchase materials free of animal cruelty, and follow fair trade guidelines. Hippie Pants is one such brand, founded by friends inspired by their life in Thailand in early 2015. Starting a clothing company in a country whose primary export is textiles meant there was a wealth of options when they started production. However, when they began the research process to get the company up and running they were deeply troubled by the ethics of the more conventional options available to them. Many workers work extremely long hours in factories with poorly monitored safety, earning worryingly low wages. Eco fashion has a much smaller share of the market, but for Hippie Pants’ founders there was no other option. The primary design goal was to incorporate the gorgeous patterns and geometric designs of Thailand without misappropriating them or removing them from the very communities that inspired them. Additionally, they wanted to minimize their environmental impact as much as possible, using only vegan raw materials such as cotton and rayon. 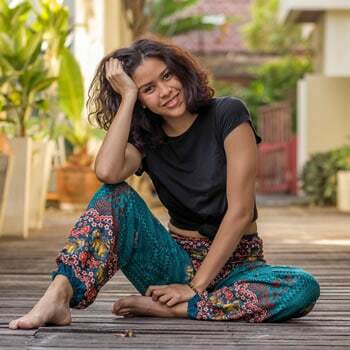 By embracing Thailand as a whole, celebrating not just its textiles and design but its entire culture, religion, food, and natural beauty Hippie Pants sets itself apart from other fair trade companies. Their social media feeds are a potpourri that showcases their designs, but also intermingles them with breathtaking Thai cultural photography. They seek to educate their followers not only on fair trade practices but on the culture, architecture and customs of Thailand, where the clothes are produced. With an audience of active followers interested in bohemian fashion and yoga, engagement is greater if people are able to see beyond the clothes. Maintaining that mixture of clothing and culture has been an effective manner to attract people not just to their brand, but to their values and their common passion: Thailand. Starting a new eco fashion line was not without difficulty. Hippie Pants needed to prioritize community involvement in order to create a product that honored Thai design without exploiting it. They did so by hiring Thai designers, tailors, and seamstresses from the outset. An early concern was many independent workers often had to buy raw materials themselves, not getting paid until they had finished the product. This created a considerable risk that they could end up in debt while trying to make a living. To relieve this burden, Hippie Pants has incorporated advanced payment as standard for all workers in Thailand. Eco fashion was born from necessity – the garment industry uses 1.5 billion gallons of fresh water each year in clothing production. Many of the highly toxic chemicals used in their production are then dumped into nearby water sources, depriving local people of access to clean drinking water. People who have relied on the rivers near these factories have lost access to important resources that they’ve depended on for hundreds, even thousands, of years. Eco fashion is now a $5 billion per year industry, whereas just ten years ago it hadn’t cracked $1 billion. This might still be a small share of global revenue, but its growth signals a major shift. For a small company like Hippie Pants creating a locally focused business is just the first step towards spreading eco fashion throughout the world. The cultural impact of eco fashion’s emergence is still developing, but beyond the shift towards sustainability in the West, fair trade practices and transformation of supply chain production has a real impact on the communities involved. For example, Hippie Pants empowers women in Thai communities to earn their own fair wages while working from home. There is a direct link between women’s increased independent income and educational opportunities for both girls and boys. Over time, this reshapes disadvantaged communities and helps break the cycle of poverty. No system is perfect, but with careful oversight and a conscientious attitude towards local concerns organizations like Hippie Pants can make a real difference just by operating in a fair, sustainable way. “Fast fashion” is one of the greatest threats to the environment that the world is currently facing. It’s easy to scold people and tell them to buy sustainably, but to many the concept of eco fashion is confusing and expensive. Educating people and creating more accessibility is therefore key to bringing about change. Hippie Pants is setting itself apart by maintaining a great deal of transparency in its purchase and delivery process, making a conscious effort to keep prices reasonable while upholding their values. Prices include shipping costs, so customers all over the world have the same access to their products at the same price. Having recently expanded to Mexico, it’s clear the model is working and that strong grassroot values, can gradually change the fashion world. Si deseas leer más artículos parecidos a The Rise of Ethical Fashion, en Revista Vinculando te recomendamos que visites la sección titulada: “English”.